Hydroxytyrosol is discovered in a form of elenolic acid ester oleuropein in olive leaf and oil. The anti-carcinogenic, antioxidant, and anti-inflammatory effects of hydroxytyrosol have been reported in the food, medical, pharmaceutical, and life science fields. But it has not been studied on skin biology field. This study is demonstrated using UVA-induced cellular aging model of human dermal fibroblast. The cell survival rate was measured using the principle of water-soluble tetrazolium salt-1 assay, which is a measurement method for cell survival rate. The quantitative real-time PCR (qRT-PCR) was used to quantitatively analyze the gene expression changes in human dermal fibroblasts (HDFs) by hydroxytyrosol. Senescence-associated β-galactosidase (SA-β-gal) assay was implemented to dye β-galactosidases (used as a cell aging biomarker) to measure HDF cell aging by UVA. Hydroxytyrosol decreased the SA-β-galactosidase activity in a dose-dependent manner in UVA-exposed HDFs. Also, the elevated expression of MMP-1 and MMP-3 by UVA were decreased by hydroxytyrosol in a dose-dependent manner. To examine the anti-inflammatory effect of hydroxytyrosol in UV exposed HDFs, the expression of inflammatory interleukins IL-1β, IL-6, and IL-8 were analyzed. Quantitative RT-PCR showed that hydroxytyrosol decreased the expression of IL-1β, IL-6, and IL-8 gene. Through this research, we demonstrate that hydroxytyrosol has effects on anti-inflammatory and anti-aging in HDFs damaged by UVA. We suggest that hydroxytyrosol is fully worthy of using as a cosmetic material effective to anti-inflammatory and to delay cellular senescence on HDFs. Skin aging refers to a phenomenon where cells are unable to be regenerated or function properly as a result of cell loss or functional deterioration (Jones and Rando 2011; Kirkwood 2005). There are various biological, chemical, and physical causes of aging; skin aging as a result of continuous exposure to ultraviolet radiation is referred to as skin photoaging (Fisher et al. 1997; Wenk et al. 2001). Exposure of the skin to a high level of ultraviolet rays causes direct cytotoxicity and subsequent apoptosis (Netzel et al. 2002). When ultraviolet rays are irradiated onto incubated fibroblast in vitro or living tissues, matrix metallopeptidase (MMP) expression increases and collagen generation decreases; this ultimately damages connective tissues in the dermal skin layer (Brenneisen et al. 2002; Chung et al. 2002; Moon et al. 1992). Continuous exposure to UVA, which affects a large number of living organisms, not only damages the DNA, but also affects cell survival and growth and induces protein denaturation, pigmentation, and creation of reactive oxygen species (Sinha and Haader 2002). Also, several research findings suggest that UVA and UVB damage DNA and generate reactive oxygen species, inducing apoptosis (Assefa et al. 2005), which directly or indirectly causes an inflammatory response (Bickers and Athar 2006). If such response progresses in the skin for a long time, inflammatory factors are excessively secreted damaging normal tissues and cells, and thereby acting as causative factors for diseases such as cancer, high blood pressure, diabetes, and heart disease (Guzik et al. 2003; Patel et al. 2007). Recently, active researches are conducted on natural effective ingredients and traditional medical substances to treat intractable skin diseases and inhibit inflammatory skin diseases from progressing to their chronic stages. These researches are used as references for the production of cosmeceutical and health supplements (Kim et al. 2013a; Lee and Im 2011). Olives have been extensively researched and utilized in many fields over the last few years, and besides having antioxidant effects, they also strengthen the immune system and boost the energy levels, and it has been reported that they are effective in treating respiratory diseases and skin wound infections and in relieving cold symptoms (Kitani et al. 2002). Olive leaves are considered as the best polyphenol complex with balanced super polyphenols such as hydroxytyrosol, tyrosol, caffeic acid, and oleuropein (Choi et al. 2008). It has been reported that DHPEA-EDA (hydroxytyrosol), also found in olive oil, is effective in protecting the red blood cells against oxidative damage, in comparison with other ingredients (Fatima et al. 2007). The researches on the inflammatory effects of hydroxytyrosol discuss its anti-cancer effects on colon and breast cancer (Sun et al. 2014; Warleta et al. 2011), its effects on osteoarthritis prevention and neuroprotection, and its inhibitive effects on oxidative stress and infection mediators (Facchini et al. 2014; Cabrerizo et al. 2013). Also, a skin-related study examined the photoprotective and anti-melanin effects of phenol compounds contained in olive leaf (Olea europaea L. var. Kalamata) extract on HaCaT cells (Ha et al. 2009). However, no research has been conducted on hydroxytyrosol as a cosmetic material. This study will examine the applicability of hydroxytyrosol, which contains a variety of bioactive substances, as a cosmetic ingredient, as a research on potential cosmetic ingredients for the further development of the cosmetic industry. The human dermal fibroblasts (HDFs) used in this study were purchased from Sigma-Aldrich Corporation (USA). To incubate HDF cells, Dulbecco’s modified Eagle medium (DMEM; Hyclone, USA) containing 10% fetal bovine serum (FBS; Hyclone) and 1% penicillin/streptomycin (100 IU/mL penicillin, 100 μg/mL streptomycin; Invitrogen, USA) was used, and HDF cells were incubated in a cell incubator at 37 °C with 5% CO2. When hydroxytyrosol (Sigma-Aldrich, USA) was used in a purified (> 90%) liquid state, it was dissolved in dimethyl sulfoxide (DMSO; Sigma-Aldrich) to achieve an appropriate concentration before use and was added to the medium for pre-processing for 6 h. A UVA lamp (UVP, USA) was used to irradiate UVA on cells, and the UVA wavelength was measured using a fiberoptic spectrometer system USB2000 (Ocean Optics, USA). The culture medium was removed from the cell culture tray, which was subsequently cleansed two times with phosphate-buffered saline (PBS, pH 7.4), and 1 mL PBS was added to the cleansed HDFs to prevent the cells from drying before UVA irradiation through the open lid of the cell culture dish. After irradiation, PBS was removed, a new medium was added, and the cells were incubated for 24 h and then used for the experiment. The cell survival rate was measured using the principle of water-soluble tetrazolium salt-1 (WST-1) assay, which is a measurement method for cell survival rate using formazan dye, generated by the reaction between mitochondrial dehydrogenase and water-soluble tetrazolium salts. After inoculation of HDFs (3 × 103 cells/well) on a 96-well plate and incubation for 24 h, hydroxytyrosol and UVA were treated in adequate concentrations and then cultured for 24 h. Further, 10 μL of the EZ-Cytox cell viability assay kit reagent (It’s Bio, Korea) was added to the incubated cells, and 1 h later, the absorbance was measured using a microplate reader (Bio-Rad, USA). This experiment was repeated three times to calculate the mean and standard deviation of the cell survival rate. The incubated cells were dissolved in the Trizol reagent (Invitrogen, USA), and then 0.2 mL chloroform (Biopure, Canada) was added to react at room temperature. The supernatant fluid containing mRNA and infranatant fluid containing protein were separated by centrifugation for 20 min at 4 °C at 12000 rpm. Then, 0.5 mL isopropanol was added to the supernatant fluid, which was subsequently left to stand at room temperature for 10 min. Afterward, RNA was precipitated through centrifugation at 4 °C at 12,000 rpm, and it was cleansed with 75% ethanol and subsequently dried at room temperature with ethanol removed. RNase-free water was used to dissolve the dry mRNA that was used for the experiment. Nanodrop (Maestrogen, USA) was used to purify the extracted RNA, and only the RNA that exceeded the purity level, namely, a 260/280 nm ratio of 1.8, was used for the experiment. In order to produce cDNA from the extracted RNA, 1 μg RNA and 0.5 ng oligo dT18 were manufactured to total 10 μL in a PCR tube and then processed for 10 min at 70 °C to induce RNA denaturalization. M-MLV reverse transcriptase (Enzynomics, Korea) was used to synthesize cDNA through 1-h reaction at 37 °C. The quantitative real-time PCR (qRT-PCR) was used to quantitatively analyze the gene expression changes in HDFs by hydroxytyrosol. A reaction solution was produced in qRT-PCR by mixing 0.2 μM primers, 50 mM KCl, 20 mM Tris/HCl pH 8.4, 0.8 mM dNTP, 0.5 U Extaq DNA polymerase, 3 mM MgCl, and 1X SYBR green (Invitrogen) in a PCR tube. PCR was carried out using LineGene K (BioER, China). The effectiveness of PCR was verified with a melting curve, and each gene expression was standardized with β-actin’s expression for comparative analysis (Table 1). Senescence-associated β-galactosidase (SA-β-gal) assay was implemented to dye β-galactosidases (used as a cell aging biomarker) to measure HDF cell aging by UVA. SA-β-galactosidase assay was incubated for 24 h after HDF (2 × 105 cells/well) incubation for 24 h with the senescence detection kit (Bio vision, USA). Afterward, hydroxytyrosol was treated in the concentrations of 5 and 10 μM and incubated for 24 h after 8 J/cm2 UVA irradiation. The medium was removed from the incubated HDF, which was subsequently cleansed with 1 mL PBS and then added with 0.5 mL fixing solution, and then left at room temperature for 15 min to be immobilized. 0.5 mL mixed staining solution (staining solution 470 μL, staining supplement 5 μL, 20 mg/mL X-gal in dimethylformamide 25 μL) was added to the immobilized HDF to dye the cells through 24-h incubation at 37 °C. Afterward, the dyed cells were cleansed with PBS and measured with an optical microscope (Olympus, Japan) to analyze the ratio of aged cells. Each independent experiment was repeated three times, and the results were shown in mean ± standard deviations. The findings were verified through unpaired student’s t tests and analyzed to be statistically significant when the p value was 0.05 or below. Hydroxytyrosol was used to treat human dermal fibroblasts (HDFs) in the concentrations of 5, 10, 20, and 30 μM to determine the compound’s cytotoxicity. As a result, the cell survival rate was 118% at 5 μM, 106% at 10 μM, 97% at 20 μM, and 100% at 30 μM. Therefore, it was concluded that hydroxytyrosol in a concentration of 30 μM or below is not cytotoxic. Therefore, the maximum concentration used for the experiment was 10 μM (Fig. 1). In aged cells, oxygen free radicals increase, and protein and fat chromosomes are damaged by oxidative stress (Davalos et al. 2010a). Lysosome in normal cells shows β-galactosidase activity at pH 4.0, while that in aged cells shows the same activity at pH 6.0 (Wagner et al. 2001; Lee et al. 2006). Therefore, SA-β-galactosidase assay was used to measure the ratio of aged cells by calculating the numbers of all cells and dyed cells. As a result, when HDFs were treated neither by hydroxytyrosol nor UVA, the β-galactosidase activity was 1, which rapidly increased to 7 when treated by UVA. Nevertheless, the activity decreased to 4 when treated by UVA after pre-processing of 5 μM hydroxytyrosol for 24 h and to 2.6 when treated by UVA after pre-processing of 10 μM, depending on the hydroxytyrosol concentration (Fig. 2). MMPs damage structural proteins at the dermis, which contains collagen and elastin, to induce wrinkles (Fagot et al. 2002). When the skin is irradiated by ultraviolet rays, MMP expression increases, leading to skin aging (Oh 2006). This study examines the effects of hydroxytyrosol on the skin tissues in the dermis through MMP-1 and MMP-3 gene expression changes. 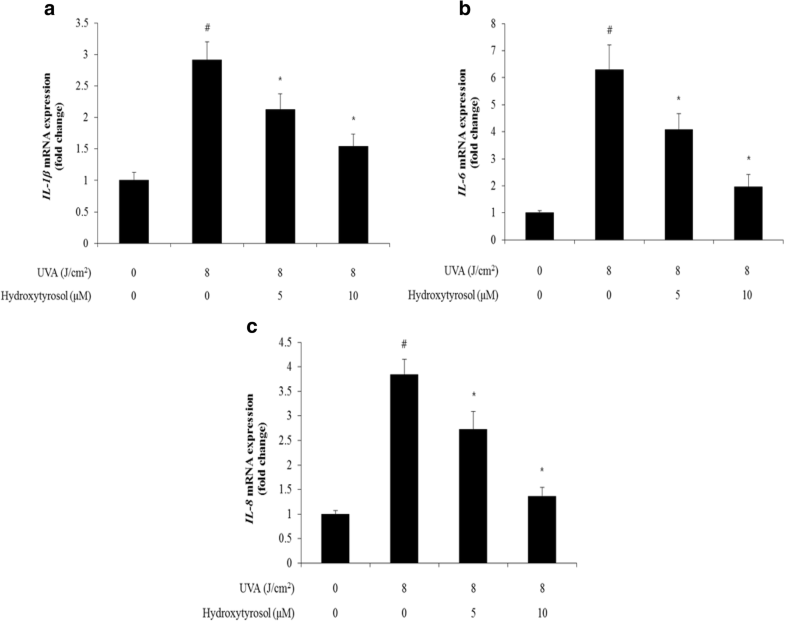 MMP-1 expression that has been increased by 3.18 times by UVA consequently decreased by 1.59 and 1.14 times with 5 and 10 μM hydroxytyrosol, respectively, depending on concentration (Fig. 3a). MMP-3 expression is increased by 5.16 times by UVA and consequently decreased to 3.35 and 1.46 times with 5 and 10 μM of hydroxytyrosol, respectively, depending on the concentration (Fig. 3b). The majority of skin-related diseases are accompanied by inflammation. Chronic inflammation not only aggravates but also accelerates aging (Abu et al. 2009; Shon et al. 2013; Lee et al. 2014). IL-1β is a pro-inflammatory cytokine that intervenes in a variety of inflammatory responses and stimulates the hypothalamic-pituitary-adrenal axis (HPA axis) to play an important role in tumor promotion and progression (Maes 2008). This study examined how much hydroxytyrosol recovered IL-1β mRNA that had been increased by UVA. IL-1β mRNA in HDFs increased to 2.92 by treatment with UVA of 8 J/cm2. This can be regarded as an increased inflammation by UVA. When hydroxytyrosol was added in concentrations of 5 and 10 μM to the group treated by UVA of 8 J/cm2, IL-1β mRNA decreased to 2.13 and 1.54, respectively (Fig. 4a). IL-6 is known as a cytokine formed from various cells, and it intervenes in cancer induction through various mechanisms, such as cellular multiplication, cell apoptosis inhibition, and promotion of the conversion from normal cells to cancer stem cells (Berner et al. 1998; Gasche et al. 2011; Hodge et al. 2005; Kim et al. 2013b). This study examined how much hydroxytyrosol recovered IL-6 mRNA that had been increased by UVA. IL-6 mRNA in HDFs increased to 6.3 by treatment with UVA of 8 J/cm2. This can be regarded as an increased inflammation by UVA. When hydroxytyrosol was added in concentrations of 5 and 10 μM to the group treated by UVA of 8 J/cm2, IL-6 mRNA decreased to 4.09 and 1.96, respectively (Fig. 4b). IL-8 is an inflammation-inducing chemokine that first reaches the area of tissue damage or microbial infection. It amplifies inflammation by mobilizing neutrophils and basophils to the inflamed part (Bachert et al. 1999). 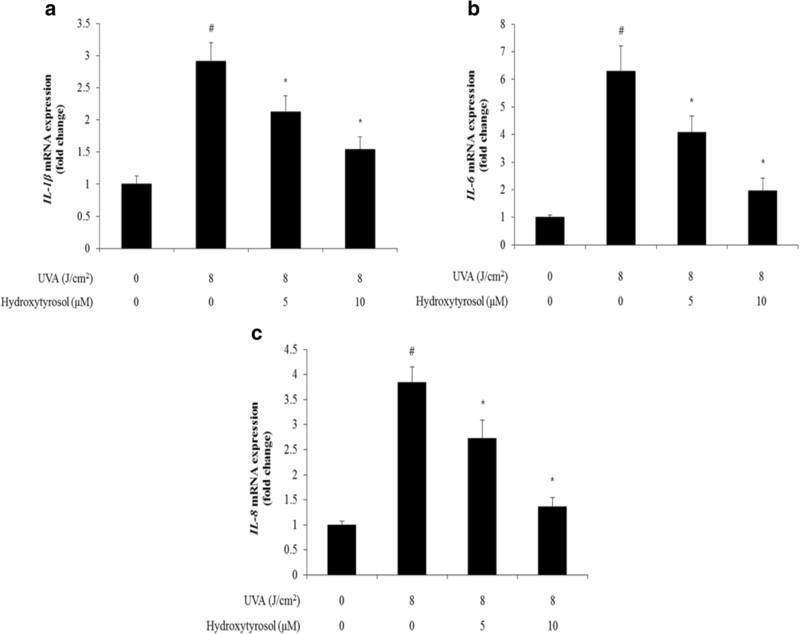 This study examined how much hydroxytyrosol recovered IL-8 mRNA that had been increased by UVA. IL-8 mRNA in HDFs increased to 3.84 by treatment with UVA of 8 J/cm2. This can be regarded as an increased inflammation by UVA. When hydroxytyrosol was added in concentrations of 5 and 10 μM to the group treated by UVA of 8 J/cm2, IL-8 mRNA decreased to 2.72 and 1.36, respectively (Fig. 4c). Cell aging generates mitochondria of various forms, reduces endoplasmic reticulum, and modifies Golgi apparatus (Dimri et al. 1995). Aged cells increase in size, granule content, and SA-β-gal activities. In aged cells, the quantity of oxygen free radicals increases, and chromosome in protein and lipid is damaged by oxidative stress (Davalos et al. 2010b). Normal cells show β-galactosidase activity in pH 4.0 of the intracellular lysosome, while aged cells show β-galactosidase activity in pH 6.0 (Wagner et al. 2001; Lee et al. 2006). The aging effects of UVA on human dermal fibroblasts (HDFs) were examined using SA-β-galactosidase assay, an aging indicator. As a result, it was confirmed that β-galactosidase activity decreases depending on the increase in hydroxytyrosol concentration (Fig. 2). Therefore, these findings suggest that hydroxytyrosol cannot completely restore cell aging, but it reduces oxidative stress onto aged cells through to subsequently inhibit the progression of aging. MMPs damage structural proteins of the dermis, containing collagen and elastin, to increase wrinkles and intervene in aging (Fagot et al. 2002). In UV-irradiated skin, MMP expression increased, by which the constituents of skin tissues, including collagen, were intensely decomposed, ultimately leading to skin aging (Oh 2006). MMP-1 (interstitial or fibroblast collagenase) mainly decomposes collagen types 1, 2, and 3, which are the major constituents of atroma, while MMP-3 decomposes a broad array of extracellular matrix (ECM), as well as proteoglycan, laminin, fibronectin, gelatin, and collagen types 3 and 4 (Knauper et al. 1996). Therefore, MMP expression changes confirm the effect on the skin tissues in the dermis to indicate the degree of skin aging. As a result of examining MMP-1 and MMP-3 mRNA expression changes that accelerate wrinkle formation, MMP-1 and MMP-3 mRNA expressions decreased by UVA depending on the concentration of hydroxytyrosol (Fig. 3). This is because collagen decomposition was accelerated by UVA that resulted in skin aging, and hydroxytyrosol reduced MMP-1 and MMP-3 mRNA expressions in a concentration-dependent manner to inhibit wrinkles in human dermal fibroblasts (HDFs) and protect skin from oxidative stress. IL-1β is known to intervene in various inflammatory responses, and it stimulates the hypothalamic-pituitary-adrenal axis (HPA axis) to play an important role in tumor promotion and progression through secretion of transposable elements and angiogenic factors (Maes 2008). IL-6 is known as a cytokine produced by various cells including T lymphocytes, B lymphocytes, neuroepithelial cells, dendritic cells, macrophages, endothelial cells, and fibroblasts to play an important role in various inflammation diseases, including allergic rhinitis (Suzuki and Ikeda 2002). IL-8 is an inflammation-inducing chemokine that first reaches the area of tissue damage or microbial infection to mobilize neutrophils and basophils to the inflamed area and amplifies the inflammatory response (Bachert et al. 1999). This study examined the IL-1β, IL-6, and IL-8 gene expression changes by treating the aged human dermal fibroblast by UV with hydroxytyrosol in different concentrations in order to identify the anti-inflammatory effects of hydroxytyrosol. The qRT-PCR technique was used to measure the changes, and it was concluded IL-1β, IL-6, and IL-8 gene expressions decreased as the concentration of hydroxytyrosol increased (Fig. 4). These findings suggest the positive anti-inflammatory effects of hydroxytyrosol in human dermal fibroblasts (HDFs) damaged by UVA. Hydroxytyrosol is found in olive fruit and oil as a major phenolic compound of olive oil. Due to its strong antioxidant effects, it has been studied in the fields of medicine, pharmaceuticals, and food (Poudyal et al. 2017; Lopez and Fonolla 2017; Visioli 2012). However, no study has been found on its effects on the skin. This study used a molecular biological mechanism to propose the applicability of hydroxytyrosol as an anti-aging and anti-inflammatory ingredient. First, senescence-associated β-galactosidase (SA β-Gal) activities were examined as an aging indicator. It was confirmed that when treated, hydroxytyrosol decreased its activity in a concentration-dependent manner and inhibited cell aging (Fig. 2). MMP expression changes affect the skin tissues in the dermis to indicate aging. Therefore, this study confirmed that increased MMP-1 and MMP-3 expressions by UVA (which accelerates wrinkle formations) decreased depending on the concentrations of hydroxytyrosol when treated (Fig. 3). The qRT-PCR technique was used to examine the effects on IL-1β, IL-6, and IL-8 gene expressions as the pro-inflammatory cytokines that act as a catalyst of inflammatory responses. This study verified that as the concentration of hydroxytyrosol increased, IL-1β, IL-6, and IL-8 gene expressions decreased (Fig. 4). These findings show the anti-inflammatory effects of hydroxytyrosol in human dermal fibroblasts (HDFs) damaged by UVA. Resultantly, this study confirmed the anti-aging and anti-inflammatory effects of hydroxytyrosol on the skin cells. Therefore, it will be applicable as an anti-aging and anti-inflammatory cosmeceutical ingredient for future clinical researches of products containing hydroxytyrosol. MC did all of the research backgrounds such as experiments, data collection, and statistical analysis, and SJ wrote the draft manuscript. Both authors read and approved the final manuscript.